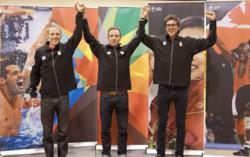 For the first time since 1996 Canada will nominate three male marathoners to the Canadian Olympic Team. Reid Coolsaet of Hamilton, Ont., Eric Gillis of Antigonish, N.S., and Dylan Wykes of Kingston, Ont., all dipped below Athletics Canada’s Olympic marathon standard of 2:11:29 before the qualifying deadline of April 22. “Being nominated to the Canadian Olympic Team is one of those memories that an athlete cherishes for the rest of their life,” said Sylvie Bernier, Assistant Chef de Mission for the 2012 Canadian Olympic Team. The marathon is well known as a grueling event, and neither Coolsaet, nor Gillis, nor Wykes had an easy road to qualify. Reid Coolsaet qualified at the Toronto Waterfront Marathon, running 2:10:55 in less than ideal windy conditions.Eric Gillis ran under the standard at the same event. With only a few hundred metres to go in the race, he dug deep and gave it one last kick crossing the finish line with only one second to spare. Wykes made the standard on April 15, exactly one week from the qualifying deadline, at the Rotterdam Marathon in Amsterdam. Everything went right for him in Amsterdam, where he recorded the second fastest marathon time in Canadian history. In 1996 Canada was represented in the male marathon by Bruce Deacon, Peter Fonseca and Carey Nelson. The trios’ top finisher was Peter Fonseca who placed 21st overall in a time of 2:17:28. The complete Athletics team will be nominated to the 2012 Canadian Olympic Team after the completion of the Track & Field Trials June 27 - 30 in Calgary, Alta.